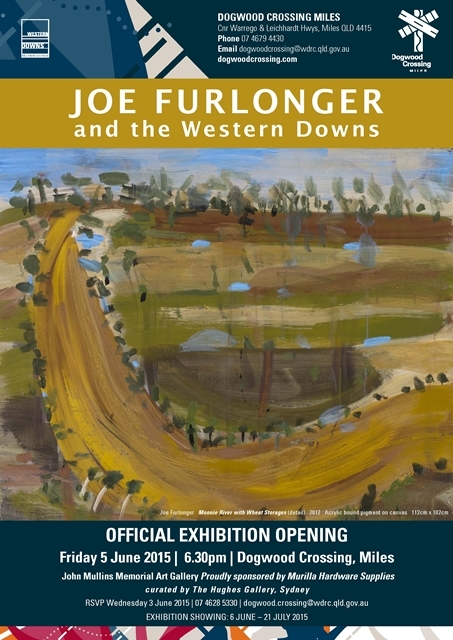 An exhibition of paintings and works on paper spanning 16 years, focusing on the region of the Darling Downs, by notable Queensland painter Joe Furlonger. Furlonger is an artist who seeks out landscapes that develop his ideas and challenge his compositions, documenting the land and what man makes of it. This selection of works clearly demonstrate Furlonger’s interest in ‘working Australia’ and his ability to genuinely connect with the local landscape of rural Australia and the lives of the people who live and work there. 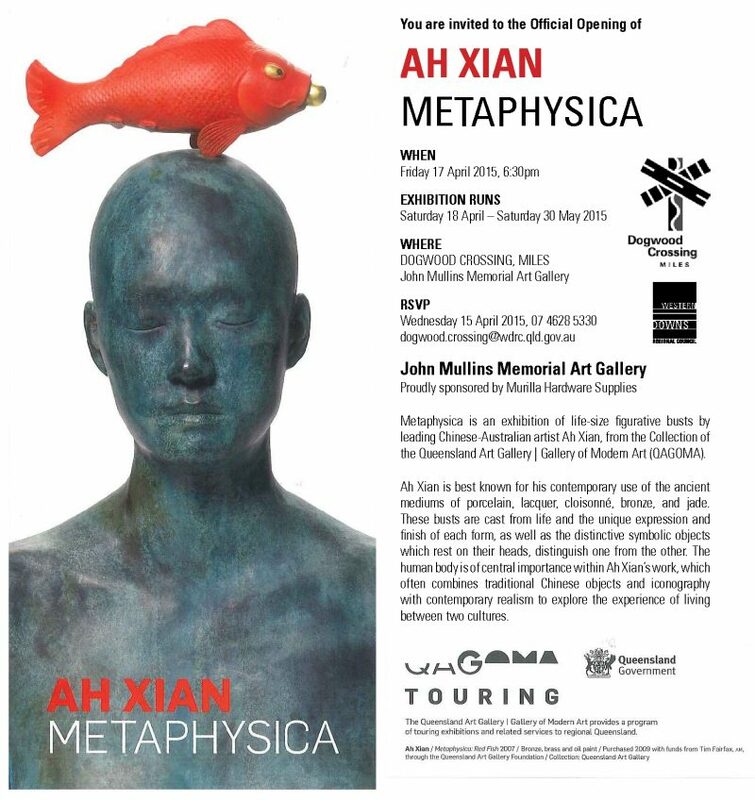 Metaphysica is an exhibition of life-size figurative busts by leading Chinese-Australian artist Ah Xian, from the Collection of the Queensland Art Gallery | Gallery of Modern Art (QAGOMA). Ah Xian is best known for his contemporary use of the ancient mediums of porcelain, lacquer, cloisonne, bronze and jade. These busts are cast from life and the unique expression and finish of each form, as well as the distinctive symbolic objects which rest on their heads, distinguish one from the other. The human body is of central importance within Ah Xian’s work, which often combines traditional Chinese objects and iconography with contemporary realism to explore the experience of living between two cultures. 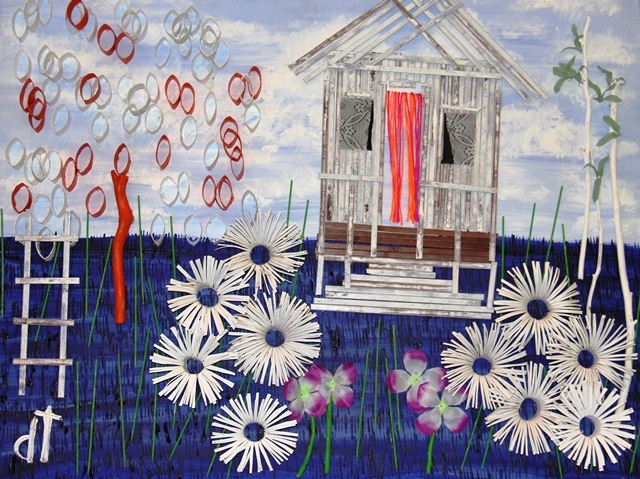 Perennial favourites, Six Artists From Out of Nowhere, return to Dogwood Crossing in 2015 with a playful and introspective exhibition. In the Looking Glass showcases self-portraits in paint and bronze. 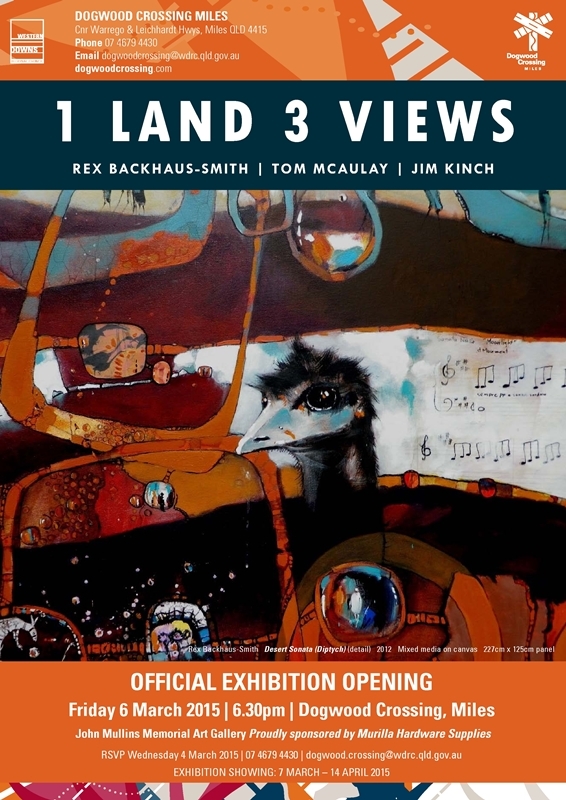 1 Land 3 Views brings together the work of three highly regarded Australian artists. Leading Queensland artist, Rex Backhaus-Smith works in both watercolour and acrylics. His contemporary landscapes are inspired by history, native animals, and man’s impact on the land. Tom McAulay grew up in Innisfail and roamed the country painting people and places. Renowned for his charcoal stockmen studies; mustering and droving oils and colourful characters in pen and wash, he portrays a nostalgic yet realistic view of life on the land. Jim Kinch sees the same people and places, but through the eyes of an Irish immigrant. His impressionistic approach lends itself to action and atmosphere such as working stockmen, the hubbub of a bar room, and the fun of local sporting events. 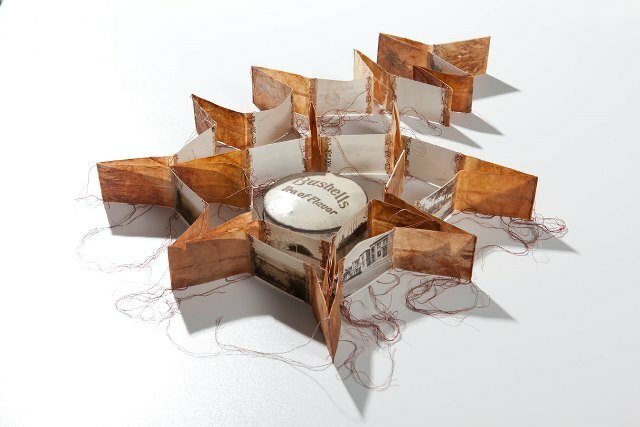 The box form is a recurring motif in Dorothy Haig’s arts practice. In Memory Keepers the box is used as a strategy to compartmentalise memory and meaning. The box forms in this context also refer to the classic 1950s design feature, the shadow box, used to bring order to a collection of stuff. The shadow box stories in this exhibition examine domestic activity and the inter-meshed role of women by referring to the universally cyclical situations of child, sister, friend, lover, wife, housekeeper, mother, and grandmother. Ultimately grandmothers, as storytellers, hold the key to our history, they are the keepers of our collective memory. 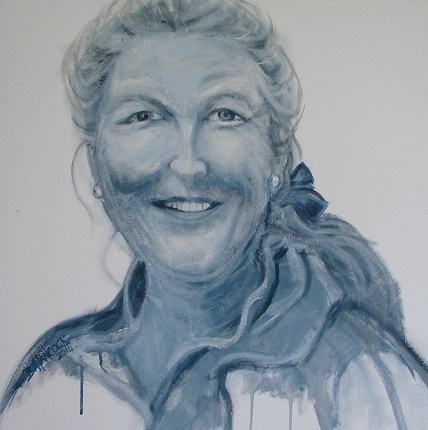 Gleny Kohnke is an Australian artist who has spent much of her life living outside Australia. Her concern for threatened animal species has moved her to highlight this perilous situation through a painted series of threatened African animals. 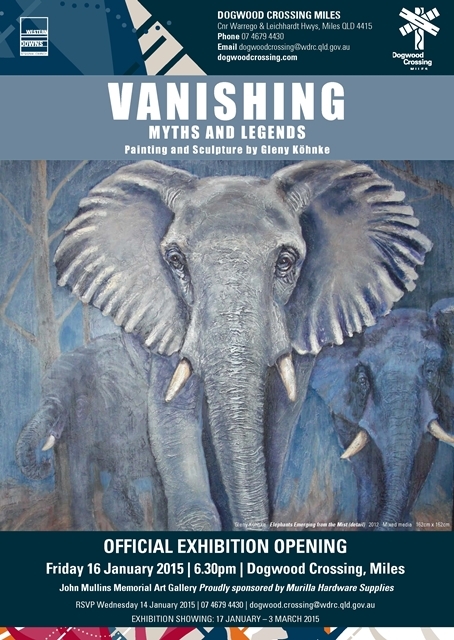 The centrepiece of the exhibition is a progression of magnificent elephant paintings depicting the elephant in concert with the moon. As the series progresses, the moon wanes until the elephant fadeds from our view. The final instalment reveals a mother elephant and two calves emerging from the mist, bringing hope for the future of the species. The exhibition is complemented by striking welded metal sculptures profoundly influenced by Kohnke’s immersion in the cultures, mythologies and oral traditions of Papua New Guinea. Donna Thomas loves rubbish! For her what others reject is a springboard to creative expression. Donna believes through creative re-use you can express yourself artistically when you need to, not when circumstances provide the opportunity to access traditional art products. Donna is passionate about sharing the notion of creative reuse and inspiring others to express and create using everyday household and found objects which would normally be designated to landfill.